The Angus Helijector is a selfcontained skid-mounted foam proportioning system, comprising a foam storage tank, water turbine, foam pump and all interconnecting pipework. All components are manufactured from materials accepted for offshore use and are mounted within a robust steel framed skid. Developed primarily for offshore helideck monitor protection systems, the Helijector is available in three sizes to match constant flow rates of 900, 1800 and 2700 litres/minute at 7 bar and is particularly suitable for use with the Angus Oscillating Monitor. The unit is also ideal for use with any other fixed foam system with a known constant flow where very low maintenance is a priority. The Angus Helijector requires no external power source other than the fire main water and operates immediately once the water inlet valve is opened after pump start up. 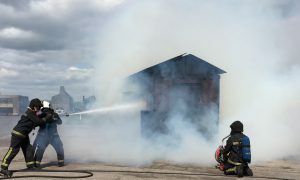 The initial foam supply gives a running time at 7 bar of between 10 minutes and 30 minutes (see OPERATING DATA) but the atmospheric foam storage tank can be replenished during use to allow continuous operation. The Helijector is designed to provide a fixed percentage foam concentrate injection (1 %) into a monitor or similar foam system with a constant foam solution demand of 900, 1800 or 2700 litres/minute at 7 bar inlet pressure, or 3% for a 900 litres/minute system operating at 7 bar g. A small amount of mains water is used to drive a pelton wheel turbine connected to a foam pump and the amount of concentrate delivered relates directly to the turbine speed. The system thereby automatically compensates for variations in water flow caused by small fluctuations in system pressure, so operation is maintained. A convenient flushing line is provided to pass clean water through the foam pump after use.